Trace is a collection of cups and bowls that show an individual pattern, a trace. 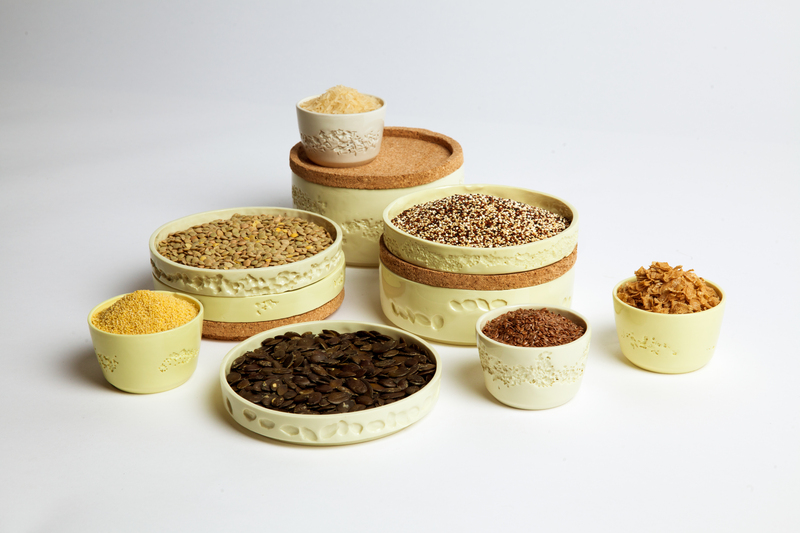 The relief on the outer shell shows grains and seeds, that can be stored inside. During the burning process the organic material is burnt away, leaving its negative shape, slightly abstracted. 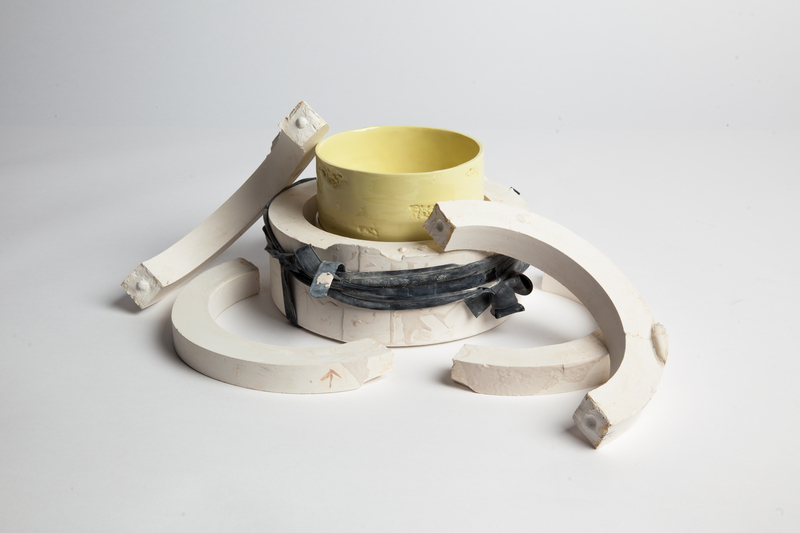 At the starting point of my project I declared porcelain as the material I want to work with. I not only wanted to work traditionally on the mould and burning but wanted to manipulate the material. With salt, sand, stones, grains and seeds, that I mixed in the liquid porcelain mass, I managed to change the composition of the material. I became curious about organic substances that can be burnt away in the oven. At their former place the porcelain left a space in their shape. Because the mixing of the materials destroyed as well the stability of the geometry I decided to only glue them in and on the outer shell. Mixing them in mass consistently let the body collapse at some point or let it even explode in the oven before the end of the first burn. The grains and seeds assembled every time differently and I received similar, but still individual outcomes. 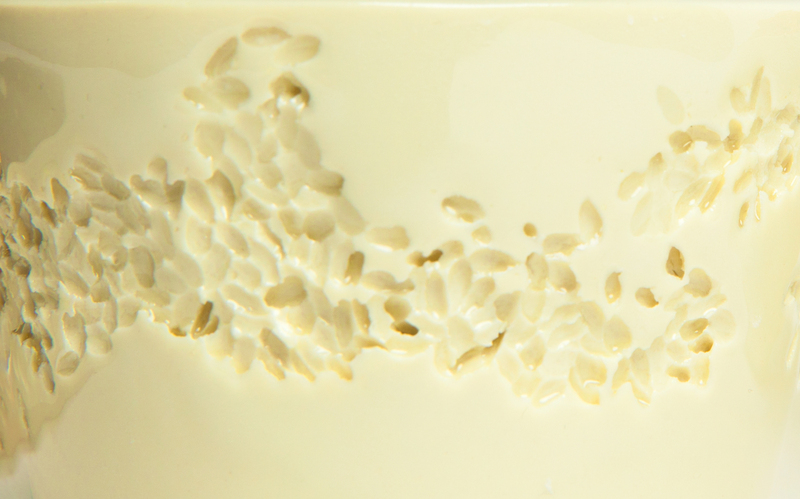 Every grain or seed needs a slightly different treatment to manage the stress ratio in the porcelain work, to not let the material explode . Some can be left in the first burn, others need to be picked away after the first molding. For the shape of the mould I decided for cups and stackable bowls for storing, accompanied by interlayers of cork. The cups show a form family were each outside shows a different structure. 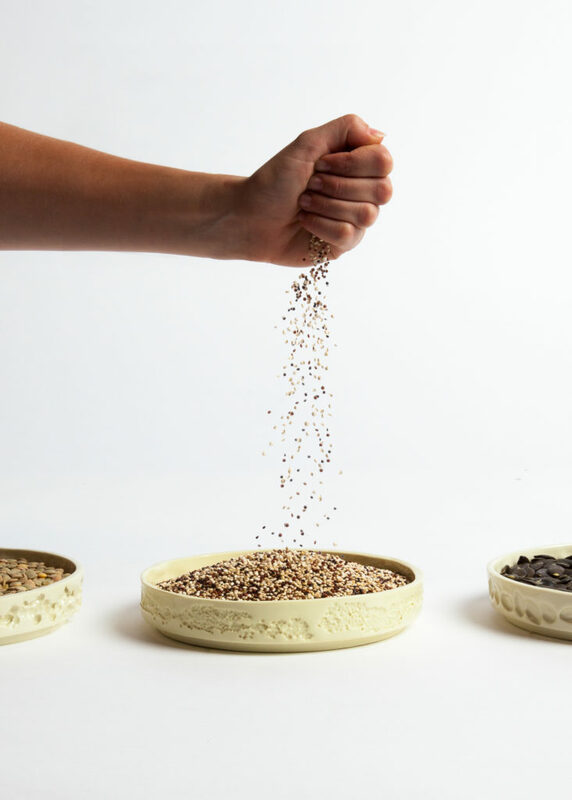 Each storing bowl reveals its content through the traces left by the burnt away seed or grain. The coloring of the collections fades from rich yellow to the classical porcelain white. Starting with a porcelain mass enriched with the maximum of pigments, the color fades gradually by adding non pigmented mass mould after mould until the mass completely lost the yellow pigments.